Amongst the slew of incoming new yarns for the Fall and Winter seasons, I found these three gems. 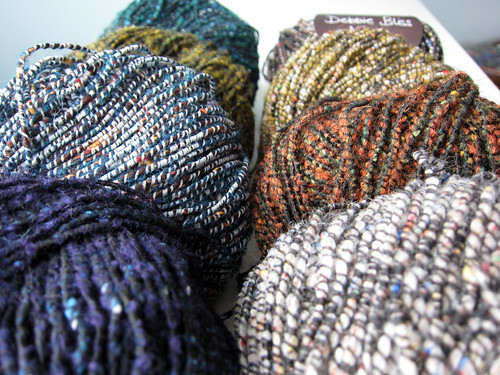 Each of these yarns is from a different, but very well known company. 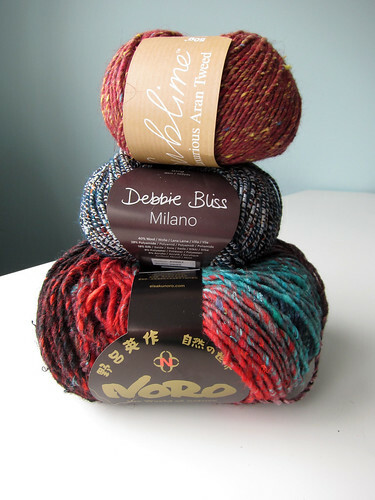 We have Luxurious Aran Tweed from Sublime, Obi from Noro, and finally Milano from Debbie Bliss. As you may have gathered by now, I’m a bit of a texture geek. Colour is great and all, but I knit because it’s so tactile! Anyway, I felt that these yarns make for a bit on balance and contrast as a group. First up, Luxurious Aran Tweed. This is a 40% cotton, 40% wool, 20% llama aran weight yarn. It is surprisingly light and lofty given it’s fibre content, and does boast some truly fantastic tweediness, which is always a good thing. I would like to see it done up in a big Ships and Seaside style cowl. Next, Noro Obi. At 14st/4″, this is the heaviest out of the group. 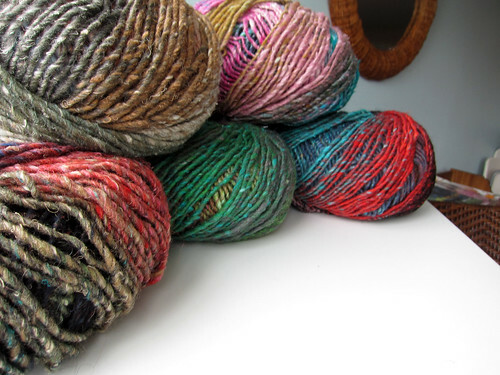 With 55% wool, 35% silk and 10% mohair, it carries on the unique tradition of Noro with an entirely unpredictable range of colours, and a decidedly rustic hand. 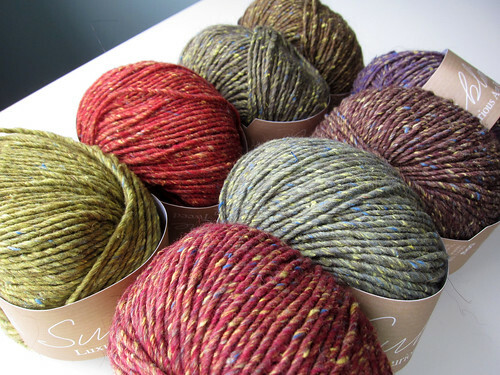 Now I often have trouble getting on the Noro bandwagon, but I do think that Obi would be brilliant as a bulky, autumnal vest. And partly because side by side comparisons are handy, and partly because I really just felt like stacking some yarn… here’s a group shot. See you in September, folks! This entry was posted on Tuesday, August 27th, 2013 at 8:54 pm	and is filed under Uncategorized. You can follow any responses to this entry through the RSS 2.0 feed. Both comments and pings are currently closed.